Intermittent supply is an ongoing problem for the development of the renewable power market. Could cryogenic energy storage prove the best way to reduce waste by saving off-peak power for later use? Birmingham University's Professor Richard Williams argues the case. 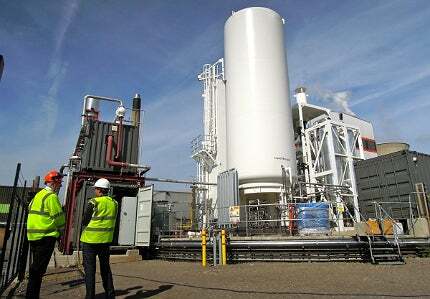 Highview's pilot cryogenic energy storage plant in Slough, UK, has been operating since 2010. Image courtesy of Highview Power Storage. When the 'liquid air' is reheated, it expands to a gas that drives a turbine. Image courtesy of Highview Power Storage. A diagram showing the CES process. Image courtesy of Highview Power Storage. All the component parts involved in the CES chain are proven technologies. Image courtesy of Highview Power Storage. As eco-friendly energy generation methods such as wind and solar power continue to mature, the ultimate goal of an efficient, economically viable renewable energy network now seems tantalisingly close. The ongoing refinement of technologies like photovoltaics and wind turbines has eased doubts that renewables can, with the right conditions and plenty of investment, plug the gap left by decommissioned fossil fuel and nuclear plants. "The plant has shown that CES is technically achievable and meets expectations of performance." Back in February, the Spanish Wind Energy Association announced that between November 2012 and the end of January 2013, wind energy had produced more electricity than any other power sources in the country. With more than six terawatt hours generated by Spanish wind farms in January alone, it has become clear the scalability of renewables (or wind power at least) is no longer the problem. But like Tantalus, the tragic figure of Greek myth, the fruit of renewable power success always seems just out of reach, no matter how low-lying it seems. One of the major stumbling blocks holding back renewable energy development is the intermittent nature of its supply. If we lived in a world where the sun always shines and the wind always blows, these natural resources would likely already be our main sources of energy. In reality they are fickle forces, prone to over-producing when demand is low and failing to meet requirements when demand peaks. As such, surplus electricity generated by wind farms is often wasted when it is not required. In the UK, constraint payments of more than £26.5m have been made for around 185 gigawatt hours of unused wind power since 2011, shifting the cost of a complex and wasteful system on to taxpayers. It’s certainly true that constraint payments are also made to non-renewable power generators, but it’s still a dispiriting statistic for a power source that is shouldering the burden of increasing expectations. Professor Richard Williams, the University of Birmingham’s pro-vice-chancellor and head of the College of Engineering and Physical Sciences, set out what he believed to be the root cause of the problem in a June 2013 article for The Conversation. "Why do we tolerate a marketplace that throws away last night’s energy from wind farms that should have been captured for use today?" he wrote. "That we are subsidising the costs of wind farms only to dump the energy they generate is clearly abhorrent. The answer is that we have no cost effective way to provide for the storage of energy." Along with smart upgrades such as better grid interconnection, developing a more extensive network of energy storage systems is the key to reducing waste in the energy supply chain in general, and boosting the fortunes of intermittent renewables in particular. As a result, utilities and technology specialists have been experimenting with different energy storage methods for years now, with well-established hydro-electric storage and more modern battery and fuel cell systems attracting attention. But while these technologies have proven successful in many cases, they also have drawbacks for extensive power applications – industrial-scale batteries require costly rare-earth metals, fuel cells can be prohibitively expensive to scale up and there are obvious geographical limitations when it comes to pump-storage hydro-electric dams. Cryogenic energy storage (CES) is an innovative new technique of capturing and storing electricity – its developers hope it will address the niggling issues that have prevented other systems from solving the energy market’s storage woes. It appears the UK Government is also confident in the inherent qualities of CES. The Engineering and Physical Sciences Research Council (EPSRC), the country’s public research funding organisation, recently announced £85m in government funding for university research projects. Among the recipients was the University of Birmingham, which won £6m to create a new Centre for Cryogenic Energy Storage. "The ‘clever’ bit is storing the cold that is released when the air expands at the end of the process." Professor Williams, who is the lead investigator on the university’s newly-funded project, explains the basics of how CES works. "The process starts by using off-peak electricity – perhaps when the wind is blowing and demand is low – to refrigerate air down to -196°C so that it becomes a cryogenic liquid, ‘liquid air’ [or liquid nitrogen]. "This can be easily stored in containers in large quantities, until power is needed at peak times, or when the wind stops blowing. At this point, the liquid air is pumped out of the container and warms up in the ambient temperature or by using waste heat from a nearby source. This causes it to expand rapidly into a gas with 700 times the liquid volume, turning a turbine which generates the electricity." The base efficiency of this process is relatively low at around 25%, but there are a number of ways to significantly improve performance. "The ‘clever’ bit is storing the cold that is released when the air expands at the end of the process, and using that to help in the refrigeration at the start of the cycle," says Williams. "This dramatically increases the efficiency of the system." Cold recycling can reportedly increase the power efficiency of the system to around 50%, according to Highview Power Storage, a London-based CES developer that has been heavily involved in the technology’s early refinement. The company adds that by using waste industrial heat from another nearby facility – a power station, say – to warm up the liquid nitrogen, efficiency could go as high as 70%. "Surplus electricity generated by wind farms is often wasted when it is not required." The process seems both innovative and technically sound, but with research centres such as the University of Birmingham, companies like Highview and the UK Government all committing resources to the technology, will it live up to its promise? Williams, who expects the Centre for Cryogenic Energy Storage’s new labs to be up and running within nine months with the goal of studying the CES process from beginning to end, believes CES’s advantages make it well-suited to addressing intermittent generation problems. The only by-product of the process is cold air, no rare or toxic materials are required and the component parts of a CES unit are familiar and proven technologies, reducing the technology risk. "Cryogenic storage systems are well-suited to capturing electricity from renewables as they can be easily scaled according to the electricity coming in by adjusting the size of the liquefaction unit, the total amount of energy that can be captured by having bigger or smaller containers, and the delivered power through the size of turbine installed," Williams says. "The system doesn’t have geographic or geological constraints, like pumped hydro storage or compressed air energy storage, so can be placed near generation or demand centres." The strongest proof-of-concept for CES in the UK at the moment is Highview’s pilot plant in Slough, which has been installed at an 80MW biomass power station since 2010. This working unit, which has been used as a test-bed for collaborative research projects with Leeds University, hosts a 60-tonne liquid nitrogen tank capable of storing around 2.5MW-hours of energy, or enough to power 300 homes for about eight hours. The project is central to Williams and the new centre’s research efforts. "The plant has shown that the CES system is technically achievable and meets expectations of performance," he says. "It has validated process modelling undertaken by Highview, giving confidence as to how a bigger scale plant will perform. The plant will be the ideal test-bed for new materials and processes developed at Birmingham. Professor Yulong Ding, currently at Leeds, who has the experience of working in cryogenic energy storage and helping develop the pilot plant, is coming to Birmingham in October as director of the centre." With its favourable economics, proven process and unique operational advantages, CES could be the perfect technology to dominate the power market’s increasingly valuable energy storage niche. In doing so, it could prove to be a decisive factor in the success of intermittent renewables. But as Williams attests, to capitalise on the momentum and maintain the UK’s position as a world leader in the technology, the commitment to CES must grow from here. "The capital equipment needs to be followed up with funding for skilled researchers to make use of the new facilities, support to help the scale-up of the technologies being developed, and policy signals which will create the market for energy storage to draw in further private sector investment," he says. "The innovation process should be coordinated and strategic, or the advances we make in the UK will be lost again to the benefit of other countries." A unique collaboration between the UK and India could see the end to harmful crop residue burning practises, while also providing a decentralised renewable energy source to remote farming villages in the Punjab. Public support for onshore wind in the UK is supposedly at a record high, so why is the government offering financial inducements to persuade communities to host wind farms?